The Missouri Mom: Pumpkins, Pumpkins, Pumpkins, and so much fun to be had! Pumpkins, Pumpkins, Pumpkins, and so much fun to be had! Guess what guys I have discovered (via a few friends) another Pumpkin Patch to have a fun adventure at! Perryville Pumpkin Farm in Perryville, MO...I must confess I have not visited...YET...but do plan to soon, but I have heard nothing, but great reviews about this place and wanted to share it with you, so you can plan your trip out. 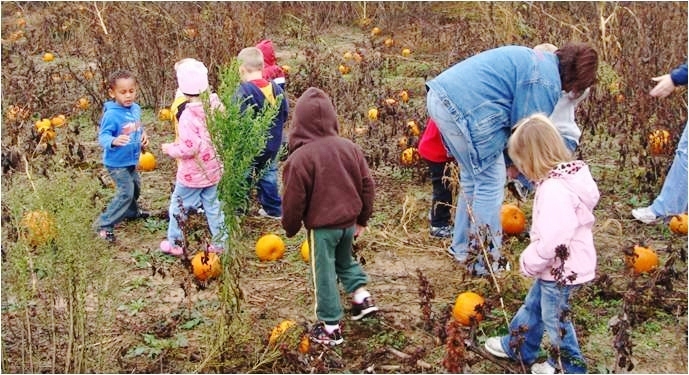 The Perryville Pumpkin farm is a working farm that is open 7 days a week September through November. On site they have pumpkins, gourds, squash, straw, stalks, straw tunnel, animals, and 1/2 Corn Maze, PUMPKIN BOWLING, small corn pit, and handmade/homegrown shop with local jammes, jellies, and ect. Wagon rides to the patch to pick your own pumpkin start in October on Saturdays & Sundays from noon till 6 pm or by appointment...cost $3.50 a person. They also have group packages and after school package deals available. This sounds like the perfect fall afternoon adventure for anyone...for more information please visit their facebook page Perryville Pumpkin Farm or give them a call at 573-513-2899. They are located at 1410 Allens Landing Road in Perryville, MO. Have a great "rainy here in Southeast Missouri" day!